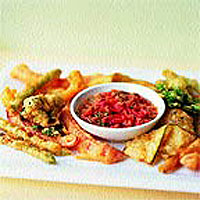 Crispy battered vegetables to dip into a fiery sauce. Leave out the chilli if you prefer. To make the sauce, heat the oil in a pan and cook the shallots and garlic for 3-4 minutes, until beginning to soften. Add the tomatoes, chillies and seasoning. Simmer gently for 20 minutes, or until thickened and pulpy. Set aside. In a large bowl, whisk together the milk, egg yolk and salt. Sift the flour into the bowl and whisk to make a batter. Heat 4cm of sunflower oil in a deep pan. Spread a little flour on a plate. Dip the vegetable pieces, one at a time, into the flour, then the batter to coat, and carefully drop into the oil. Cook in batches for about 2 minutes, until golden. Drain on kitchen paper. Stir the parsley into the sauce, and serve with the warm fritto misto.